Objective Western lifestyle and diet are major environmental factors playing a role in the development of IBD. Titanium dioxide (TiO2) nanoparticles are widely used as food additives or in pharmaceutical formulations and are consumed by millions of people on a daily basis. We investigated the effects of TiO2 in the development of colitis and the role of the nucleotide-binding oligomerisation domain receptor, pyrin domain containing (NLRP)3 inflammasome. Design Wild-type and NLRP3-deficient mice with dextran sodium sulfate-induced colitis were orally administered with TiO2 nanoparticles. The proinflammatory effects of TiO2 particles in cultured human intestinal epithelial cells (IECs) and macrophages were also studied, as well as the ability of TiO2 crystals to traverse IEC monolayers and accumulate in the blood of patients with IBD using inductively coupled plasma mass spectrometry. Results Oral administration of TiO2 nanoparticles worsened acute colitis through a mechanism involving the NLRP3 inflammasome. Importantly, crystals were found to accumulate in spleen of TiO2-administered mice. In vitro, TiO2 particles were taken up by IECs and macrophages and triggered NLRP3-ASC-caspase-1 assembly, caspase-1 cleavage and the release of NLRP3-associated interleukin (IL)-1β and IL-18. TiO2 also induced reactive oxygen species generation and increased epithelial permeability in IEC monolayers. Increased levels of titanium were found in blood of patients with UC having active disease. Conclusion These findings indicate that individuals with a defective intestinal barrier function and pre-existing inflammatory condition, such as IBD, might be negatively impacted by the use of TiO2 nanoparticles. Titanium dioxide induces reactive oxygen species (ROS) formation as well as inflammation in vitro and in vivo. The nucleotide-binding oligomerisation domain receptor, pyrin domain containing (NLRP)3 inflammasome is activated in the presence of titanium dioxide. Polymorphisms in the Nlrp3 gene have been linked to the development of Crohn's Disease. Oral administration of titanium dioxide nanoparticles worsens intestinal inflammation in the dextran sodium sulfate (DSS) mouse model of colitis. Titanium dioxide crystals accumulate in the spleen of DSS-treated mice following oral gavage. 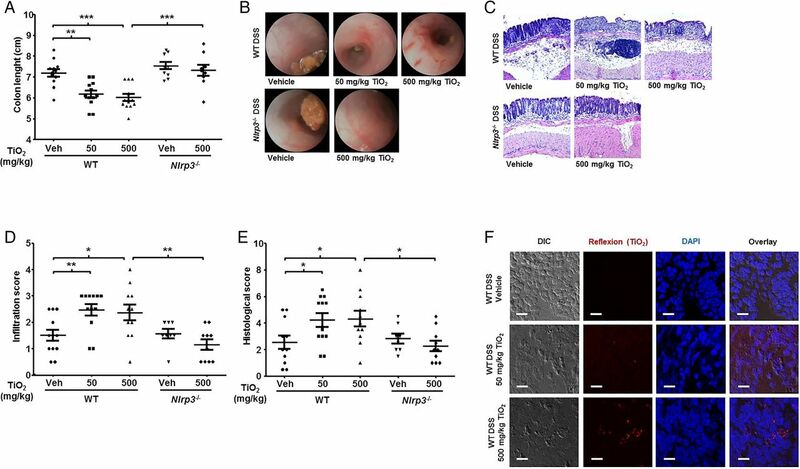 Titanium dioxide particles accumulate and activate the NLRP3 inflammasome in human intestinal epithelial cells and macrophages. Levels of titanium are increased in the blood of patients with IBD. Components of the inflammasome may represent novel therapeutic targets for the treatment of IBD. Our results suggest a cautionary use of titanium dioxide in pharmaceutical formulations and support a therapeutic benefit from low inorganic particle diet in patients with IBD. In the present study, we analysed the effect of TiO2 on intestinal inflammation as well as the contribution of the NLRP3 inflammasome in TiO2-mediated inflammatory responses. For this purpose, we used the dextran sodium sulfate (DSS) acute colitis model in the wild-type (WT) and NLRP3-deficient (Nlrp3−/− ) mice. Oral administration of TiO2 nanoparticles worsened intestinal inflammation through NLRP3. Moreover, crystals were found to accumulate in splenic tissue of TiO2-administered mice, but not in those receiving water. In vitro experiments showed that both TiO2 nanoparticles and food grade TiO2 microparticles trigger proinflammatory cytokine secretion through NLRP3 inflammasome activation, and accumulate in human intestinal epithelial cells (IECs) and macrophages. TiO2 particles induced ROS production in IECs and increased epithelial permeability. Finally, an increase of titanium burden in blood of patients with UC having active disease was found, evidencing an impaired barrier function and suggesting that TiO2 nanoparticles could pose a specific risk to patients with IBD. Acute colitis was induced in female WT (C57BL/6J) and Nlrp3 −/− mice between 12 and 14 weeks of age by oral administration of 1.5% DSS30 (MP Biomedicals) in drinking water ad libitum for 7 days. A suspension of TiO2 nanoparticles (rutile, 30–50 nm, IoLiTec) in drinking water was administered daily by oral gavage. WT mice were divided in three groups of 12 mice each, and received water, 50 or 500 mg TiO2/day/kg bodyweight. Nlrp3 −/− mice received water (n=10) or 500 mg TiO2/day/kg bodyweight (n=10). On day 8, colitis was assessed by endoscopy and mice were sacrificed for sample collection. All the animal experiments were approved by the veterinary authorities of Zurich, Switzerland. Animals were anaesthetised intraperitoneally with a mixture of ketamine 90–120 mg/kg bodyweight (Vétoquinol) and xylazine 8 mg/kg bodyweight (Bayer), and colonoscopy was performed as described previously.31 Animals were sacrificed and colon length was measured. About 1 cm of tissue was removed from the distal third of the colon and fixed in 4% formalin overnight. H&E stained sections of the paraffin-embedded tissue were used for histological analysis. Histological score was determined as described previously32 ,33 by two independent, blinded investigators. Total protein from cell monolayers was harvested into M-PER lysis buffer (Thermo Fisher Scientific) and western blotting was performed to determine the expression of NLRP3 (Enzo life sciences), caspase-1, ASC, IL-1β (Cell Signaling Technologies) and IL-18 (MBL). Co-immunoprecipitation (Co-IP) was performed overnight at 4°C using NLRP3 antibody. Immunocomplexes were collected with Protein G Sepharose beads (GE Healthcare) for 1 h at 4°C prior to western blotting. Confocal reflection microscopy was combined with fluorescence microscopy in a Leica SP8 laser scanning confocal microscope, as described previously.28 Caco-2 cells grown on coverslips and transwells were fixed with 4% PFA for 20 min. Coverslips were directly subjected to H&E staining. Cryosections of transwells with Caco-2 monolayers were cut at cryogenic temperatures at 5–20 μm thickness. Sections were stained with H&E or DAPI-containing mounting medium (Vector Laboratories) and images were captured using a fluorescent microscope (Axioplan2, Zeiss). For electron microscopy, Caco-2 cells were fixed and embedded in Epon according to established protocols.34 Electron microscopic analysis, including elemental analysis was performed with a CM12 electron microscope (FEI) equipped with an EDX detector (Genesis, EDAX). For quantification of intracellular microparticles, 5 μm sections of TiO2-stimulated Caco-2 monolayers grown on transwell membranes were used. Particles and aggregates of TiO2 were counted in phase-contrast view, and DAPI-stained nuclei were counted in blue fluorescent channel. THP-1 cells were maintained in RPMI medium (Invitrogen) supplemented with 10% fetal calf serum (VWR). To induce differentiation, 40 nM phorbol-12-myristate-13-acetate (Sigma-Aldrich) was added to 0.5×106 cells/mL. Caco-2 and HT-29 were obtained from the German Collection of Cells and Microorganisms (DSMZ). Other IEC lines were provided and previously described35 by the Department of Internal Medicine Regensburg and cultured under conditions as recommended by the DSMZ. Inflammasome activation was triggered in IECs with crude lipopolysaccharide (Santa Cruz) at a concentration of 10 μg/mL. TiO2 (AHRSE; geometric particle size of ca 0.36 μm, PSD of around 1.35), an uncoated anatase of high purity used in cosmetics and food, was obtained from Huntsman Pigments. Particles were sterilised by addition of 1 mL 70% ethanol to 20 mg TiO2 and by subsequently vacuum freeze-drying. Particles were resuspended in ultrapure water and sonicated for 5 min to obtain a homogenous suspension. Mononuclear phagocyte progenitor cells were flushed from femural and tibial bones from C57/BL6 mice with cell culture medium. After centrifugation, cells were resuspended in medium containing 30 ng/mL recombinant murine macrophage-stimulating factor (Biovision) and kept for 5 days before stimulation with 20 μg/mL TiO2 and 5 μM cytochalasin D (Invivogen). ELISAs directed against active forms of IL-1β (R&D Systems) and IL-18 (MBL) were conducted with cell culture supernatants according to manufacturer's instructions. Undifferentiated THP-1 cells were transfected with three sets of small interfering RNAs (siRNAs) for caspase-1, ASC and NLRP3 at a concentration of 100 pmol each, and electroporated using the Amaxa nucleofector kit (Mirus Bio LLC) following manufacturer's instructions. Caco-2 and HT-29 cells were stained with 1 µg/mL acridine orange (Sigma-Aldrich) for 15 min prior to TiO2 and cytochalasin D stimulation. Lysosomal rupture was analysed by fluorescent microscopy (Axioplan2, Zeiss). IECs were incubated with Hank's balanced salt solution (HBSS) (Sigma-Aldrich) containing 50 μM of dihydro-dichlorofluorescin diacetate (Sigma-Aldrich) for 30 min at 37°C. ROS-induced fluorescence was detected using a microplate reader with an excitation wavelength of 485 nm and an emission wavelength of 528 nm. Caco-2 cells were grown as monolayers on transwell membranes as described above. Flux of fluorescein isothiocyanate-dextran beads (average molecular weight 40 000, Sigma-Aldrich) was measured 2 h after addition of 1 mg/mL beads to the apical compartment. Fluorescence intensity in aliquots from the basolateral compartment was measured using a microplate reader with an excitation wavelength of 485 nm and an emission wavelength of 525 nm. The study was conducted as a subproject of the Swiss IBD Cohort Study and was approved by the Ethics Committees (EK 1316).36 Prior to inclusion into the study, written informed consent was obtained from all patients. Inclusion criteria for enrolment of patients with IBD having active disease were 18–80 years of age and at least one episode of active disease between 1 September 2010 and 31 August 2011. Flare-up episodes reported by the patient were verified by a physician in the course of a clinical examination. Inclusion criteria for enrolment of patients with IBD in clinical remission were 18–80 years of age and maintenance of clinical remission between 1 September 2010 and 31 August 2011. Exclusion criteria in this study were perianal CD and positive results of microbiological workup of faecal samples for known infectious agents. Clinical activity in patients with CD and patients with UC was assessed using the Harvey Bradshaw Index (HBI)37 and the Rachmilewitz Index,38 respectively. A flare-up episode in patients with CD was defined as a rise in HBI value of ≥4 points. A flare-up in patients with UC was defined as an increase in the Rachmilewitz Index value of ≥5 points. Titanium levels in blood samples from healthy volunteers (n=28), patients with UC having active disease (n=5), patients with UC in remission (n=6), patients with CD having active disease (n=8) and patients with CD in remission (n=9) were measured by inductively coupled plasma mass spectrometry (ICP-MS) at the Department of Forensic Pharmacology and Toxicology of the University of Zurich, Switzerland. All calibration standard solutions were prepared from 1 mg/mL single element standard solutions (Merck) by dilution with ultrapure water. About 0.5 mL of whole blood from patients was diluted in 4.5 mL ultrapure water and infused into the ICP-MS. Seronorm trace elements whole blood samples (level 3; titanium concentration: 24 µg/L; accepted range 20–28 µg/L) were prepared in the same manner as the whole blood samples from patients and used as control (SERO AS). A Varian ICP-MS 810 (low resolution) equipped with type 142 Varian cooler and a Varian SPS 3 Autosampler (Varian) were used with the following measurement parameters: analysis type: quantitative; acquisition mode: steady state; scan mode: peak hopping; spacing: coarse; points/peak: 1; scans/replicate: 50; replicates/sample: 3; plasma flow: 18.00 L/min; auxiliary flow: 1.75 L/min; sheath gas flow: 0.24 L/min; nebuliser flow: 1.00 L/min; sampling depth: 5.00 mm; power: 1.35 kW; pump rate: 7 rpm; stabilisation delay 0 s; ion optics (volt) version number: 0; first extraction lens: −1.00; second extraction lens: −129.00; third extraction lens: −214.00; left mirror lens: 32.00; right mirror lens: 17.00; bottom mirror lens: 28.00; corner lens: −199.00; entrance lens: −1.00; fringe bias: −4.50; entrance plate: −32.00; detector focus: true pole bias: 0.00; sampling aerosol generation: nebuliser, source: autosampler; fast pump during sample delay/rinse: On; probe height: 0 mm; premix: Off; rinse time: 10 s; spray chamber cooling: on spray chamber temperature: 3.00°C; sample uptake delay: 50 s; smart rinse: No; switch delay: OFF; scan time: 1415 ms; replicate time: 70.75 s; titanium isotope for quantification: 49. All chemicals (eg, water, acid, hydrogen peroxide) and materials (eg, tubes, blood Monovettes including needles) were checked for interferences. All results were under the detection limit of the procedure (0.25 µg/L). Calibration was done in every series, using standard solutions of 1, 10 and 100 µg/L Titanium and a blank. The results of the Seronorm quality control samples were very good. Mean (n=14) of the results of the Seronorm control level 3 (target value 24 µg/L) was 24.5 µg/L with a coefficient of variation of 9.6%. Thus, the method was more than suitable for our purposes, especially considering that, while accuracy may be marginally compromised, relative differences between the groups should stay the same. Statistical analysis was performed using Student's t test, Mann–Whitney test or one-way analysis of variance with Dunnett's post-test. The results are expressed as mean±SEM and significance was set as p<0.05. To study the impact of TiO2 nanoparticles in colitis, and the role of NLRP3 inflammasome in TiO2-mediated effects, DSS-treated WT and Nlrp3−/− mice were administered with 0, 50 or 500 mg/kg/day TiO2 nanoparticles by oral gavage. WT mice receiving TiO2 presented a more severe colitis than mice receiving TiO2-free drinking water, as evidenced by a significant shortening of the colon (figure 1A), and colonoscopy results (figure 1B). In contrast, Nlrp3 −/− mice administered with 500 mg/kg/day TiO2 showed no differences in colon length or colonoscopy findings compared with WT and Nlrp3 −/− mice receiving water (figure 1A,B). Similarly, H&E stained sections of colonic tissue presented a significantly higher inflammatory cell infiltration (figure 1C) and total histological score with a severe disruption of the mucosal epithelium in TiO2-treated WT, but not Nlrp3 −/− mice (figure 1D,E). Mice receiving TiO2 in the absence of colitis did not present shortening of the colon, or increased histological scores (data not shown), suggesting that TiO2 might be deleterious only in pre-existing inflammation. Recent studies have shown that, after intravenous injection of TiO2 in rats, significant levels of TiO2 in spleen and liver were still found 30 days post injection.39 When applied intraperitoneally in mice, TiO2 was distributed throughout the entire body but was mainly retained in liver and spleen.40 In our experimental setting, analysis of splenic cryosections using a combination of confocal and reflexion microscopy revealed that oral administration of TiO2 led to the accumulation of crystals in the spleen of DSS-treated mice in a dose-dependent manner (figure 1F). Administration of titanium dioxide (TiO2) nanoparticles aggravates colitis in the dextran sodium sulfate (DSS) mouse model of acute colitis through activation of the nucleotide-binding oligomerisation domain receptor, pyrin domain containing (NLRP)3 inflammasome. (A–E) DSS-treated wild-type (WT) and Nlrp3 −/− C57BL/6J mice received TiO2 by oral gavage as indicated. Mice were sacrificed at day 8 and colon length was measured (A). Mucosal damage was assessed by colonoscopy (B). H&E staining of sections displayed severe barrier breakdown (C) with extensive infiltration reaching the lamina muscularis mucosae (D). Total histological score was calculated as the sum of epithelial damage and infiltration score (E). Results represent mean±SEM; WT mice: n=12, Nlrp3 −/− mice: n=10, *p<0.05; **p<0.01; ***p<0.001. (F) Cryosections of spleen from DSS-treated WT mice administered with TiO2 or TiO2-free water were fixed and nuclei were stained with DAPI (blue). The presence of crystals (red) was analysed combining confocal reflection microscopy with fluorescence microscopy. Results are representative of four experiments. Scale bars: 10 μm. Since IECs have rarely been used in NLRP3 inflammasome studies, protein expression of NLRP3 was confirmed by western blot in human IEC lines (see online supplementary figure S1A). Interestingly, both nanoparticles and microparticles induced IL-1β secretion in the monocytic cell line THP-1 (figure 2A), as well as caspase-1 cleavage (figure 2B) and IL-1β cleavage (figure 2C) in both Caco-2 and THP-1 cells. Co-IP of NLRP3 further evidenced the association of the inflammasome components caspase-1, ASC and NLRP3 on stimulation with both TiO2 crystal forms (figure 2D). TiO2 microparticles induced IL-18 cytokine secretion in Caco-2 and THP-1 cells (figure 2E,F). 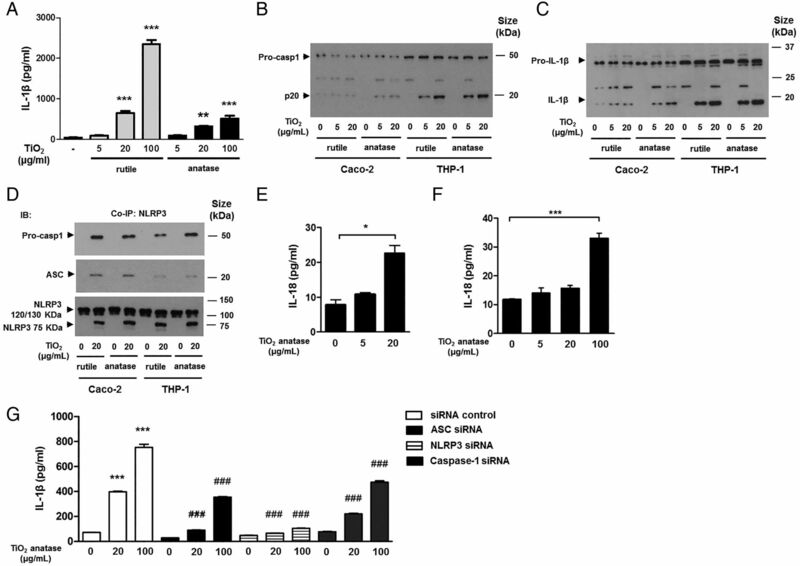 Moreover, siRNA knockdown of the inflammasome components NLRP3, ASC and caspase-1 in THP-1 cells significantly reduced the levels of IL-1β in the presence of TiO2 demonstrating that TiO2-induced IL-1β release is NLRP3 inflammasome-dependent (figure 2G). Caspase-1 downstream effectors are activated in macrophages and intestinal epithelial cells (IECs) on exposure to titanium dioxide (TiO2). (A) THP-1 cells were treated for 24 h with indicated amounts of TiO2 nanoparticles and microparticles, and the secretion of active interleukin (IL)-1β in cell culture supernatants was assessed by ELISA (n=3, **p<0.01, ***p<0.001). (B–D) Caco-2 and THP-1 cells were treated for 24 h with indicated amounts of TiO2 nanoparticles and microparticles. The activation of caspase-1 (B) and IL-1β (C) in response to 5 μg/mL TiO2 was detectable in both cell lines. Lysates were subjected to co-immunoprecipitation (Co-IP) using nucleotide-binding oligomerisation domain receptor, pyrin domain containing (NLRP)3-antibody prior to western blotting to detect caspase-1 and ASC (D). (E–G) Incubation of Caco-2 (E) with TiO2 microparticles resulted in release of active IL-18 in cell supernatants (n=4). In THP-1 cells, release of both IL-18 (F) and IL-1β (G) was significantly increased on stimulation with TiO2 microparticles (n=3, ***p<0.001), an effect that was dependent on the presence of inflammasome components. Small interfering RNA (siRNA)-mediated knockdown of ASC, NLRP3 or caspase-1 in THP-1 cells resulted in significantly lower levels of IL-1β on TiO2 stimulation (G) (n=3, ***p<0.001). In agreement with previous reports,23 incubation of THP-1 cells with food grade TiO2 microparticles led to intracellular accumulation of dark aggregates (figure 3A). Additionally, we observed that TiO2 was taken up by murine BMDMs (figure 3B). Pretreatment of BMDMs with cytochalasin D, an inhibitor of endocytosis, did not inhibit the accumulation of TiO2 aggregates (figure 3C), pointing to an endocytosis-independent uptake mechanism. As the intestinal epithelium is subjected to the major exposure to TiO2, we investigated whether TiO2 also penetrates IECs. Treatment of monolayers of the IEC lines HT-29 and Caco-2 with TiO2 microparticles for 24 h resulted in intracellular accumulation of TiO2 (figure 3D,E). To mimic the physiological setting in the intestine, tight monolayers of Caco-2 cells growing on transwell filters were stimulated apically with TiO2. Cross-sections of these monolayers revealed dark, intracellular aggregates of microparticles (figure 4A,B), which were present in a dose-dependent manner (figure 4C,D). These findings were confirmed by electron microscopy: TiO2 was detectable in cross-sections of Caco-2 monolayers as electron dense aggregates (figure 4E) and elemental analysis of selected areas confirmed that aggregates contained titanium (figure 4F). Aggregates of titanium dioxide (TiO2) accumulate intracellularly in macrophages and intestinal epithelial cells (IECs). (A) After 24 h incubation with 100 µg/mL TiO2, THP-1 cells were fixed and stained with eosin. Arrows indicate intracellular TiO2 aggregates. Scale bars: 100 μm. (B and C) BMDM were stimulated with 20 μg/mL TiO2, without (B) or with cytochalasin D (C) for 24 h, and images of live cultures were taken. TiO2 aggregates can be found in all cells, and they show a distinct distribution pattern (arrows). Inhibition of endocytosis with cytochalasin D did not abolish the uptake of TiO2. (D and E) HT-29 (D) and Caco-2 (E) cells were grown on glass cover slips and incubated with 100 µg/mL TiO2 for 24 h. Intracellular aggregates of TiO2 were found in both cell types, indicated by arrows. Scale bar: 100 µm. Aggregates of titanium dioxide (TiO2) accumulate intracellularly in Caco-2 cells in a dose-dependent manner. (A and B), Caco-2 cells grown on transwells were incubated with 100 µg/mL TiO2 for 24 h. Cross-sections were stained with H&E (A) or DAPI to visualise nuclei and the same frame was observed in phase-contrast view to identify TiO2 aggregates (B). Scale bar: 25 µm. TiO2 aggregates were located intracellularly in aggregates of various sizes, indicated by arrows. (C–F) Cross-sections were processed as described above, and TiO2 aggregates and nuclei were counted. Incubation of Caco-2 for 24 h with indicated amounts of TiO2 resulted in a dose-dependent increase of intracellular TiO2 (C). The size of TiO2 aggregates also increased in a dose-dependent manner. Electron dense regions with a diameter larger than 3.5 µm were considered as large aggregates (D). Cross-sections were subjected to transmission electron microscopy, revealing electron-dense aggregates indicated by arrows (E). The elemental analysis of a selected region (indicated as asterisk in panel E) confirmed that aggregates contained titanium, which appeared as main peak at 4.5 keV (indicated by arrow) (F). The uptake of TiO2 particles has been associated with the production of ROS,16 which are major inducers of NLRP3 inflammasome activation via stress-associated signals.41 Our results show that TiO2 microparticles induced ROS production in HT-29 (figure 5A) and Caco-2 cells (figure 5B) in a dose-dependent manner. Particulate matter has been shown to induce inflammasome activation through lysosomal rupture following endocytosis.28 To investigate whether this is also the case with TiO2 microparticles, lysosomal staining with acridine orange was performed on IECs stimulated with TiO2. Fluorescence microscopy did not show any loss of lysosomal integrity in TiO2-treated Caco-2 and HT-29 cells (see online supplementary figure S2A–C). Based on our results showing intracellular accumulation of TiO2 in epithelial monolayers, we sought to investigate the effects of TiO2 on epithelial permeability. For this purpose, we used the transwell model system with Caco-2 cells, which form tight monolayers with an apical-basolateral polarity. The treatment of Caco-2 with 20 μg/mL TiO2 resulted in a significant increase of epithelial permeability (figure 5C). Titanium dioxide (TiO2) triggers production of reactive oxygen species (ROS) and influences epithelial permeability in human intestinal epithelial cells (IECs). (A and B) HT-29 showed significantly increased production of ROS at the highest dose of 100 μg/mL of TiO2 (A). In Caco-2 cells, a significant increase of ROS was detected at TiO2 concentrations of 20 and 100 μg/mL (B). (C) Monolayers of Caco-2 cells were treated with indicated amounts of TiO2 for 24 h, and incubated apically with FITC-labelled beads for 1 h. An increase of basolateral fluorescence was observed in TiO2-treated cells as compared with non-treated cells (n=5, **p<0.05). Given the increased permeability in the mucosa of patients with IBD, and based on our findings showing the proinflammatory effects of food-derived TiO2 and its ability to traverse the intestinal mucosa in vivo, we hypothesised that patients with IBD may have a higher systemic burden of titanium. Using ICP-MS, we assessed the levels of titanium in whole blood of healthy donors and patients with IBD. Initial data analysis did not reveal significant differences in titanium levels when comparing healthy donors with patients with IBD (figure 6A). However, we observed significantly higher titanium levels in the subgroup of patients with UC having active disease (figure 6B). Patients with IBD present elevated titanium levels in blood. (A and B) Titanium levels in blood of healthy donors and patients with IBD are shown as measured by inductively coupled plasma mass spectrometry (ICP-MS) (A) (n=28 control, n=28 IBD, °depicts outliers). Titanium levels in subgroups of patients with IBD; significantly increased levels were detected in samples from patients with active UC (B) (n=28 control, n=5 UC active, n=6 UC remission, n=8 Crohn's disease (CD) active, n=9 CD remission; ***p<0.001). Our results show that oral administration of TiO2 nanoparticles enhances intestinal inflammation in the DSS mouse model of colitis. Although TiO2 concentrations used are higher than the amounts the human gut is daily exposed to, the results obtained suggest that TiO2 is biologically active and support a growing body of literature evidencing the deleterious effects of TiO2 in vivo.12 ,42–44 TiO2 proinflammatory effects required NLRP3 inflammasome activation as shown when comparing WT with Nlrp3 −/− mice. The role of NLRP3 in DSS colitis is controversial with reports showing detrimental45 ,46 and protective47 ,48 roles for NLRP3. In our study, 1.5% DSS induced a mild inflammation in WT and Nlrp3−/− mice and we did not detect significant differences between the two groups. Despite the relatively large consumption of TiO2, stability and aggregation in GI fluids has received limited attention. Recent studies using in vitro human digestion models have shown that SiO2 and Ag nanoparticles, which agglomerated under conditions of low pH and high electrolytes as in the gastric compartment, become bioavailable under intestinal conditions.49 ,50 Our mouse experiments demonstrate a dose-dependent accumulation of crystals in the spleen, pointing to the fact that ingested TiO2 can traverse the intestinal mucosa and reach the systemic circulation. This finding agrees with recent studies showing that TiO2 nanoparticles translocate through the intestinal epithelium and accumulate in the spleen in orally administered mice.51 ,52 Of note, we could not find accumulation of TiO2 crystals in the colonic epithelium, suggesting that TiO2 nanoparticles are mostly absorbed in the small intestine. This is in accordance with previous studies showing that TiO2 particles translocate through the epithelium lining the small intestine, in particular Peyer's patches.20 ,51 We show that TiO2 nanoparticles and microparticles induce NLRP3-ASC-caspase-1 assembly and caspase-1 cleavage, resulting in the release of functionally active IL-1β in Caco-2 and THP-1 cells in the absence of other stimulus. TiO2 microparticles also induced IL-18 secretion in both cell lines. Since TiO2 microparticles contain a significant amount of nanosized particles, it is likely that the effects observed on microparticle stimulation are due, at least in part, to the presence of TiO2 nanoparticles. Knockdown of NLRP3, ASC and caspase-1 abrogated TiO2-induced IL-1β expression in macrophages, evidencing the crucial role of the NLRP3 inflammasome in TiO2-mediated proinflammatory responses. In vitro experiments showed that TiO2 microparticles are taken up by human non-phagocytic IECs as well as macrophage-like THP-1 cells. In agreement with previous reports showing that TiO2 particles can enter cells via non-endocytic mechanisms,53 our results point to that TiO2 uptake was not endocytosis-mediated, and no specific subcellular structure was found to be associated with TiO2 accumulations. Moreover, we did not observe an involvement of lysosomal structures or TiO2-induced lysosomal damage, suggesting that TiO2 particles might interact with lipid membranes and are passively transported into cells, as seen with silica nanoparticles.54 TiO2 particles were shown to disturb epithelial barrier function in Caco-2 monolayers. Although small, this effect hints to an influence of TiO2 in epithelial permeability, and is in accordance with studies showing that TiO2 nanoparticles induce tight junction remodelling in the intestinal epithelium of mice.51 Mimicking human gut exposure to TiO2 particles in vitro meets often with difficulties: as TiO2 particles are in an aqueous suspension, they tend to precipitate forming blankets by the end of the incubation time. This might negatively affect cellular responses on TiO2 stimulation, especially at high concentrations. The detection of significant ROS production in TiO2-stimulated IECs is in line with previous studies showing that uptake of particulate matter is accompanied by ROS production and inflammasome activation.29 ,55 Strikingly, ICP-MS analysis revealed increased levels of titanium in the blood of patients with UC having active disease, pointing to that the disturbed barrier function associated with IBD allows for a higher translocation of TiO2 nanoparticles into the systemic blood stream. Absorbed TiO2 might enhance inflammation and barrier permeability, facilitating further TiO2 penetration on subsequent exposures. This would support the suggested therapeutic benefit from low inorganic particle diet observed in patients with IBD. For example, the reduction of nano and microparticles in the diet of patients with CD significantly decreased their disease activity within a month of treatment.56 In contrast, a posterior multi-centered follow-up with 83 patients with CD did not show any effect of a microparticle free diet.57 However, in this trial dietary calcium was also restricted, and effects may have been masked by the corticosteroid treatment received by the participants of the study. In summary, these findings show that orally administered TiO2 nanoparticles worsen intestinal inflammation in mice through the activation of NLRP3 inflammasome. TiO2 is one of the most produced nanomaterials in the world and its use as food additive is on the rise. Since TiO2 is also used in pharmaceutical formulations, local luminal concentrations of TiO2 might reach substantial levels. Depending on the properties of the pills, they disintegrate at different sections of the GI tract and can affect the epithelium in a very distinct and concentrated manner. A local accumulation of TiO2 may have profound effects on patients with a disturbed barrier function as found in IBD. Very high concentrations of particles are often chosen in toxicity studies to ensure bioactivity across the assays evaluated. Hence, there is a pressing need for biologically relevant human exposure information to facilitate interpretation of assay results. Since the long-term effects of dietary TiO2 may be revealed only in decades, after a lifetime exposition to TiO2, our data suggest a more cautious use of these particles. The authors acknowledge the expert technical support from Gery Barmettler in preparing samples for electron microscopy of the Center for Microscopy and Image Analysis, University of Zurich. EFSA. Opinion of the Scientific Panel on Food Additives, Flavourings, Processing Aids and materials in Contact with Food on a request from the Commission related to the safety in use of rutile titanium dioxide as an alternative to the presently permitted anatase form. EFSA J 2004;163:1–12. [No authors listed]. Specifications for the identity and purity of food additives and their toxicological evaluation: some food colours, emulsifiers, stabilizers, anticaking agents, and certain other substances. Thirtenth report of the Joint FAO-WHO Expert Committee on Food Additives. Rome, 27 May-4 June 1969. World Health Organ Tech Rep Ser 1970;445:1–36. European Parliament C. European Parliament and Council Directive 94/36/EC of 30 June 1994 on colours for use in foodstuffs Official Journal L 237 1994:13–29. Contributors PAR, HMB: Data acquisition, manuscript preparation; BM, SL, KA, MRS, AF-T: Data acquisition; MS, KAW, IF-W, MH, TK: Critical revision; GR: Study supervision and manuscript preparation. Funding This research was supported by a grant from the Swiss Philanthropy Foundation to GR and research grants from the Swiss National Science Foundation to GR (Grant No. 324730_138291 and 314730_153380) and the Swiss IBD Cohort (Grant No. 314730_153380).